Several videos have surfaced online that supposedly show a UFO hovering over an Islamic shrine known as the Dome of the Rock on Jerusalem's Temple Mount some time after midnight on Jan. 28. The videos have sparked a furious debate about whether we finally have evidence of UFOs. As a veteran investigator of many UFO photos and videos, these images strike me as highly dubious, and all signs point to a hoax. If you were one of the first people in the world to capture some of the most amazing video footage of a UFO taken in the past decade, why would you post it anonymously on YouTube instead of either submitting it to professional analysis, or making money by selling it to CNN or MSNBC? (In fact, there's some speculation that most or all of the videos were actually posted by a single person, which would guarantee a hoax.) Surely at least one of the videographers -- or someone working with them — would have come forward in the past 10 days to sell their story to a newspaper or tabloid. Suspicious. Second, not only do we not know who took the footage, but no one other than the videographers reported having seen the lights. The Dome of the Rock is one of the most famous and important religious sites in the world, and there are well over a million people in Jerusalem at any given time—many of them religious tourists near the Temple Mount. It's probable that there were thousands of people in the area at the time, yet no one else reported seeing or videotaping the bright light? Very suspicious. Third, though one woman can be heard in a videotape saying that the mysterious light was so bright that "you can almost hardly look at it," the object does not seem to reflect any light from the gold-plated dome below it. This is very mysterious indeed, and strongly suggests that the "UFO" light was digitally inserted into the scene. (Note also that a generic light would be among the easiest "UFOs" to fake; you don't need to worry about drawing or animating spaceship windows or wings or shadows on the craft itself.) Super suspicious. Then there's the strangely small size of the supposed alien aircraft, which can be roughly determined by comparing it to the size of the Dome over which it hovers. The UFO appears to be no more than about fifteen feet long, which seems awfully small for a spacecraft that presumably made it across the universe for its camera cameo. For anyone who still sees a UFO through the sea of red flags, there's the video analysis that shows evidence of fakery. Robert Sheaffer, a longtime skeptical UFO investigator and author of the Bad UFOs blog told Life's Little Mysteries that, "the original Jerusalem UFO has now been definitely shown to be a hoax. Effects of the video processing software are clearly seen. The hoaxer used Motion Tile effects with edge mirroring to introduce camera shake into the video. You can see the mirroring effects along the edge of the video. This proves that the video did not go directly from the camera to YouTube, that it made a stop in between inside a sophisticated video editing software suite. Once you start editing it like that, a skilled hoaxer can put practically anything in it." 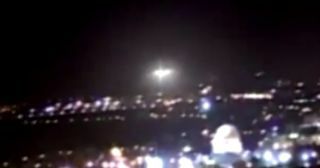 The Jerusalem UFO videos have created much controversy since they first appeared, with many believers vigorously defending the videos as real. They dismiss skeptical explanations such as these, but do not offer any better analysis. In science, of course, it's not enough to simply criticize a theory or explanation — critics are expected to put forth a better solution that fits the facts. The appearance of the UFO over Jerusalem is ironic; for many, belief in UFOs is based on faith, not evidence. Benjamin Radford is managing editor of Skeptical Inquirer science magazine and author of Scientific Paranormal Investigation: How to Solve Unexplained Mysteries. His web site is: www.RadfordBooks.com. Life's Little Mysteries is a sister site of SPACE.com.